Owning a bed and breakfast is always a work in progress. 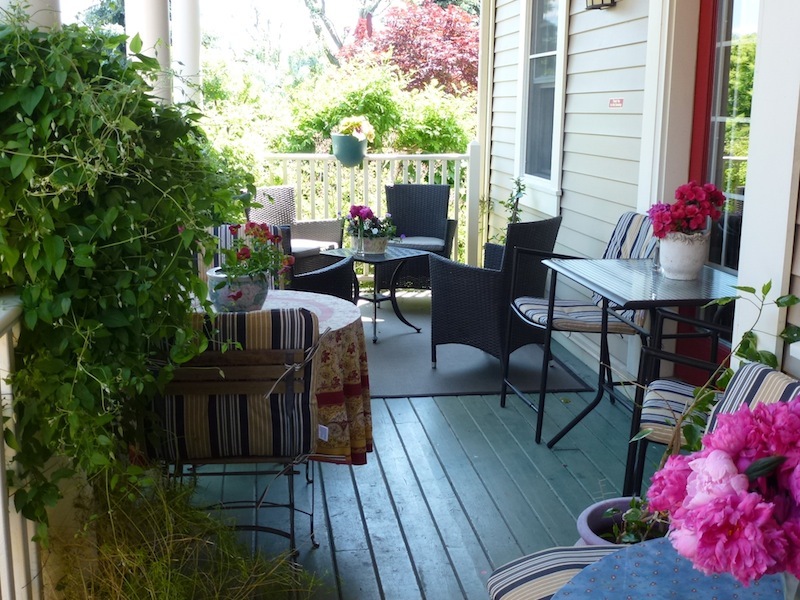 In anticipation of your upcoming visit to Niagara-on-the-Lake this summer, we’ve been busy making changes at Globetrotters B&B to enhance your comfort and enjoyment during your stay with us. If you like what you see, just click here to reserve your favourite guest quarters today. Welcome to our Secret Garden. If you’ve been here before, you won’t believe the changes we’ve made to our backyard garden. We’ve added a paved area and a covered gazebo, where Fernando serves his famous breakfasts, weather permitting. Guests love it! The area is also open to you should you decide to enjoy some appetizers and wine you’ve picked up before you head out to dinner or a Shaw performance. Enjoy breakfasts alfresco in our covered gazebo. Our popular covered veranda now features a conversation corner with four chairs as well a couple of bistro tables and chairs. Relax on our covered veranda anytime. A wrought-iron gazebo with a bistro table and chairs adorns our front deck and offers a quiet spot for you to relax as you spend a lazy afternoon reading or an evening watching the sunset. Watch sunsets from our front deck gazebo. Early this year, we completely gutted the private ensuite washroom in our Crystal Palace on the main floor and replaced it with state-of-the-art European fixtures and a roomier designer spa-like walk-in shower. You’ll love the results! Fernando is always looking for ways to enhance his breakfasts. We don’t want to give away his secrets, but a new store called OliV just opened in town and he’s creating magic with their huge variety of flavours. As always, he’s happy to share his recipes with you — provided you’re a cherished guest, of course. A fresh fruit plate to start off your day and breakfast. And… don’t forget, if you’ve stayed with us before, you’re entitled to our loyalty rate. All you have to do is call us directly at 1-866-835-4446 or 905-468-4021 to book or reserve online right here on our Globetrotters B&B reservations website.